When you’re a foodie, trying out the authentic local cuisine is a must. If you’re visiting any of these European countries, you don’t want to miss out on their most popular food or national dish. Even if you’ve had it elsewhere, trying the food in its country of origin is a different experience altogether. It’s a gastronomic experience you don’t want to miss! There are endless opportunities to spoil your taste buds in Italy, from the wide selection of pasta, pizza, and risotto. While all of these may be considered national dishes of Italy, it’s safe to say that pasta is a staple and a favourite worldwide. 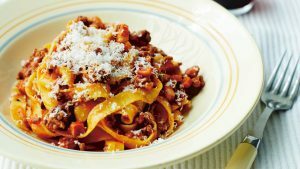 There are many different ways to cook pasta, but a classic in Italy is the ragu alla Bolognese with tagliatelle pasta, more commonly known as Bolognese. For the authentic taste of Bolognese, you have to try it in the homeland of pasta! 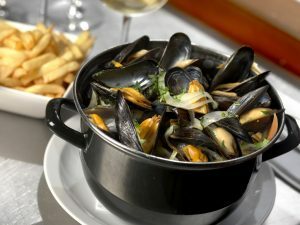 Also known as moules et frites, this dish may have a French name, but it originates from Belgium. It’s a meal of mussels and fries, with the mussels cooked differently depending on where you go. The most common way is moules marinière, which uses white wine, butter, shallots, and parsley to cook the mussels. Additionally, fries are also a major part of Belgian cuisine, so the fries are typically double fried for a moist centre and crispy outside – the epitome of a perfect fry. You might be thinking, why not the French macaroon, crêpe, or even the croissant? 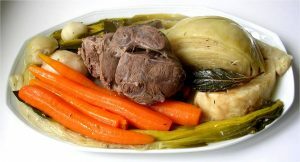 Well, if you want to eat as the locals do, pot-au-feu is a quintessential French family dish you should try. Pot-au-feu translates to “pot on the fire” and it’s essentially a French version of beef stew. It consists of beef, root vegetables such as leek, carrots, onions, turnips, and more, as well as cartilaginous meat like marrowbone and oxtail. 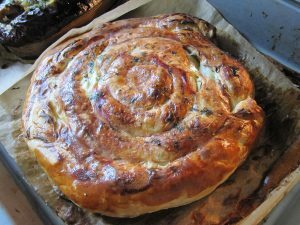 Banitsa is a traditional Bulgarian pastry with fillings of eggs, yoghurt, and white cheese. This dough dish is a popular food for breakfast and is best eaten with a yoghurt or a glass of cold buttermilk. Besides that, there are other variations that use fillings like minced meat, onions, and mushrooms for a savoury version. A sweet version exists as well, with fillings like apple, cinnamon, walnuts and sugar. No, the national dish of Turkey has nothing to do with turkey. In fact, it’s a popular dish that you might recognise – doner kebab. Seasoned meat such as lamb, beef, or chicken, is stacked and cooked on a vertical rotisserie. The meat is slowly turned and the outer layer is thinly sliced as it cooks. This meat is eaten with bread such as pita, flatbread, or even in a wrap. A country of countries, the United Kingdom is home to a variety of national food. 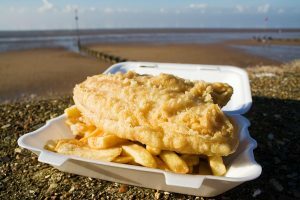 It’s hard to pick just one, but if you’re looking for a classic dish to try out, a meal of fish and chips can never go wrong! Cod or haddock is typically used, and the fish is battered with vinegar, resulting in a fluffy and light texture. Chips in the U.K. are thicker than the usual American-style fries, and it’s eaten with salt and vinegar sprinkled over it. 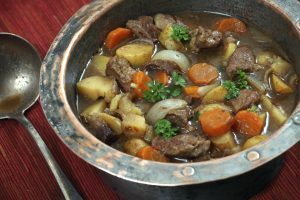 Another stew on our list, the Irish stew is different from the French stew as it uses lamb, instead of beef. The other ingredients of the stew include potatoes, onions, parsley, and sometimes carrots. However, purists of this stew insist that the right way to cook it is only with mutton, potatoes and onion. This traditional dish is simmered slowly to ensure the meat is soft and tender for the melt in your mouth texture.